Vielen Dank für Ihr Interesse und Ihre Nachricht. Während EthnologInnen/anthropologInnen heutzutage sich mehrheitlich einig sind, dass "Kulturen" in dem Sinne, wie über sie gängig in der Öffentlichkeit geredet wird, nicht existieren, sind wir uns allerdings nicht einig, was Kultur wohl sein könnte. Möglicherweise wird es nie eine Einigkeit geben, weil Kultur nicht etwas ist, was man als ein Ding antreffen kann, sondern ein Wort, das schon immer verwendet worden ist, um unterschiedliche Sachverhalte anzusprechen. Im deutschsprachigen Raum hat die Mainzer Ethnologin Carola Lentz viel darüber geschrieben, was Kultur nicht ist, und inwiefern es dennoch sinnvoll sein kann, über Kultur zu sprechen (und inwiefern nicht). Ihre neueste Publikation dazu findet sich in der jüngsten Nummer der Zeitschrift für Ethnologie (leider noch nicht online). Auf Internet findet sich auch einiges. Ich halte ihre Beiträge zum Thema für sehr hilfreich. Ich halte persönlich einiges von einer Denkweise, die weniger die kollektiven Gemeinsamkeiten oder Unterschiede zum Thema macht, und mehr das Kultivieren von Fähigkeiten, Empfindsamkeiten, Gefühlshaltungen usw. Das ist ein Ansatz, der einerseits mit Denkern wie Talal Asad verbunden ist, der von Traditionen spricht, die Menschen sich aktiv aneignen, und dabei Lernen, auf bestimmte Art und weise zu argumentieren, bestimmte Ziele für erstrebenswert zu halten, und sie auf bestimmte Art und Weise anstreben. Menschen können (und tun es auch oft) gleichzeitig in mehreren Traditionen stehen, die nicht unbedingt immer mit sprachlichen, ethnischen und religiösen Grenzen übereinstimmen. Jemand kann zum Beispiel gelernt haben, über richtig und falsch, Leben und Tod in der religiösen tradition des Katolischen Christentums oder des sunnitischen Islam zu denken, fühlen und zu agieren, aber ebenfalls in der Tradition eines Nationalismus bestimmte Menschen in "wir" und "die Anderen" zu teilen, und in den Traditionen einer politischen Ideologie die Welt aus einer eher rechten, hierarchieorientierten, oder linken, emanzipationsorientierten Warte zu sehen und zu gestalten. Andererseits ist der Ansatz, dem ich Nahe stehe, von Pierre Bourdieus Soziologie der Klassengesellschaft und dem Begriff des Habitus inspiriert: Habitus ist bei Bourdieu die Art und Weise, wie wir lernen, bestimmte Dinge natürlich, angenehm und schön zu finden, und wie diese Empfindungen Mittel im gesellschaftlichen Verteilungskampf und in Klassenunterschiede werden. Das Wichtige bei Bourdieu ist, dass oft die Unterschiede innerhalb einer Gesellschaft oder einer ethnischen Gruppe diejenigen sind, die das Meiste ausmachen, denn durch sie kommen gesellschaftliche Hierarchien und Macht zu Stande. Stéphanie Homola on 'Caught in the language of fate: The quality of destiny in Taiwan' (https://www.journals.uchicago.edu/doi/full/10.1086/698354), and an afterword by Samuli Schielke (https://www.journals.uchicago.edu/doi/full/10.1086/698268) . Pride, as this is the result of a long and inspiring collective project. Unease because of the circumstances of the project’s publication, and the troubling allegations about the journal and its management emerging through #hautalk. We would like to thank everyone who has supported us throughout the project, and we hope that destiny still has in store for HAU the possibility of new beginnings. As HAU is no longer fully open access, our links will disappear behind a pay-wall in two weeks time. So do download and maybe even read our collection while you can! While public sector cultural flagships like the Bibliotheca Alexandrina have engaged in nostalgic celebration of “cosmopolitan Alexandria” (Awad and Hamouda 2006), a certain anti-nostalgic backlash has emerged in parts of the cultural scene: Interestingly, this backlash is produced partly by the very same people who twenty years earlier were trying to reconnect their urban present with its past non-Arabic inhabitants and literatures (e.g. Raouf 2016). And paradoxically enough, it is being articulated by people who are internationally well-connected and who read both English and Arabic literature and social theory (and some read French) – that is, people who would easily qualify as cosmopolitan by most counts. Among them is Ali Al-Adawy, born in 1985 in the eastern suburb of Abu Qir, organiser of film and cultural programmes, writer and editor. Since 2014, he and some of his friends have been working to put together a research and film project about the East of the City which, in their view, has replaced the historical Downtown as the centre of the city. The East of the City – especially the district of Sidi Bishr – represents an anonymous, consumerist, at once conservative and individualist form of urbanity influenced by Egyptian migration to the Gulf, import-export business, Islamic revival, and unrestrained real estate expansion. 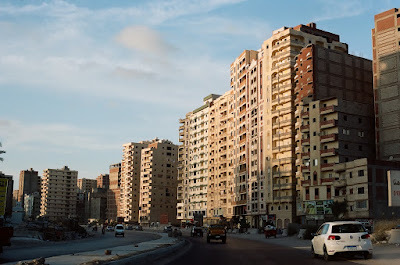 If the old central districts stand for what Alexandria may once have been, Sidi Bishr shows what it is now becoming – and quite literally so: the race to demolish villas and smaller apartment buildings and to build 15-floor high-rises in their place began in the East of the City around the turn of the millennium. Entering the east of Alexandria on 45 Street / International Road. Photo by Samuli Schielke, 2016. After 2011, this demolition and construction boom has engulfed almost the entire city. Old popular quarters like Bahary, Ghurbal and others have become thoroughly transformed, a large portion of their older houses replaced by high-rises. Exclusive new projects on landfills are making the sea inaccessible and invisible in many parts of the Corniche (El Nemr 2017). Beaches already were not free since a decade or two of privatisation of public space, but until now, one could still look at the sea for free. Some urban activists try to document and protect urban architectural heritage.1 But with government and private interests aligned towards making maximum profit from construction and real estate, a progressive erasure of the city appears unstoppable. And with the gradual disappearance of the sea shore behind resorts on landfill, one day Alexandria may no longer be a city by the sea for its non-privileged inhabitants. A long discussion followed after the presentation. Although it had not been a major theme in the workshop, a controversy about “nostalgia or not” dominated that discussion. The theatre director and manager of a performing arts NGO Ahmed Saleh claimed: “Also today’s writings were loaded with nostalgia, just like the writings of the past 20 years. What new does Benjamin offer?” Abdelrehim disagreed and pointed out that three of the five texts presented were critical of nostalgia; only his and Yasmine’s leaned towards nostalgia. Hakim commented that Ahmed probably intentionally played the role of the provocator. More important than nostalgia or not, he went on, was to question the classist aspirations of the specific nostalgia for a city by the sea. From what kind of societal configuration did that city emerge? Mohamed Elshahed, editor of the Cairobserver magazine on urbanity and architecture in Egypt, insisted on a more complex picture. The way we speak about the past reflects the way we speak about the present and reproduces its blind spots, he argued. What is left out in the binary of the khawagas (as in Durrell) and the popular quarters (as in Kharrat), he argued, is the social history of Alexandria from the 1940’s to 60’s, a period of major social mobility of urban inhabitants of Egyptian origin, when many rural migrants climbed into bourgeois society. The presentation of the Benjamin workshop in March 2016 marked a departure from the nostalgic tone that had dominated the photo exhibition and poetry symposium in 2011. It lined up with an emerging shift from the binary towards the fragmentary in writings about the city, such as in Alaa Khaled's Alexandrian Faces (2012) that brings together past and present characters of the city in a mosaic that combines both icons of the cosmopolitan era such as Cavafy as well as more recent eccentric outsiders such as the football fan and graffiti writer Gamal El-Dowaly. The Benjamin workshop also coincided with other cultural events and publications in 2016 that balanced between a nostalgic search for ways to remain connected to the city’s 20th century history and the positive values it might represent on the one hand, and a demand to recognise the self-erasing, conflicted, and divided character of the city’s present and past, on the other hand. Events I attended include a history workshop curated by Aliaa Mosallam that highlighted social conflicts and radical politics in the early 20th century (Nizar 2016), and a public debate on the curse and possible uses of nostalgia organised by Amro Ali. What had changed? A generational shift is part of the story. Some participants in the Benjamin workshop, notably Hager Saleh and Hakim Abdel Naim, are young enough to have experienced their generational formation during the revolutionary period. But others had been active in the scene already before 2011, and Abdelaziz ElSebaei was born in 1949. Nostalgia is a reflection of the present against which it is posited, and the present had changed. For those who around 2016 questioned the nostalgia for old Alexandria, the very recent events of the revolution provided a more pertinent nostalgic relation to the present. Theirs was now a more conflicted and combatant longing for a future very recently lost, and the myth of an unchanging spirit of true Alexandria appeared less helpful to provide orientation in the city and country they lived in. By 2016, after a defeated revolution and a victorious construction boom, the topos of unsolved conflicts and permanent erasure had become more pertinent, and the nostalgic vision of connectedness and openness more difficult to maintain (see also Faruq 2017). And yet the critical rethinking of the city and its myths also shows remarkable continuities – personal, institutional and thematic alike. The essays of the Benjamin workshop were published in the Tara al-Bahr magazine dedicated to literary, historical and theoretical reflections about Alexandria. It is edited by some of the same people who were present at the Walther Benjamin workshop – and mostly read by people in the same circles. Its authors include people like Khaled Abdel Raouf and Maher Sherif who in the past played a major role in the literary rediscovery of non-Arabic Alexandria. It was made possible by a European grant for three issues (which the editors stretched to make four), and while it does not serve the Euro-cosmopolitan myth, it does converge with a donor interest in cities and urbanity. The same magazine also published the above-quoted text by Hakim Abdel Naim – and the Arabic translation of an earlier version of this article (Schielke 2016). Like Alaa Khaled's literary work and Aliaa El Mosallam's history workshops, also Tara al-Bahr is consciously aimed at producing a complex rather than a binary vision of the city. And yet by the very virtue of its intensive concern with the city as such, as its primary topic and focus, it, too, contributes to the mythologisation of Alexandria. It is a different myth, however. It tells of Alexandria as a perishing, non-permanent city made of conflicts, fragmentation and erasure. The myth of the non-permanent city has the paradoxical advantage over the myth of the cosmopolitan open city that it is more inclusive. It has space for both Manshiya and Sidi Bishr, both Bahary and the Chinese Housing. The myth of the non-permanent city is cosmopolitan in its own way, in the sense that it tells about the urban coexistence of difference; however it highlights conflicts over harmony. I am definitely not impartial in this matter. Part of a wider shift of academic interest towards understanding Alexandria as an ordinary city in the present (see, e.g., El Chazli 2018), this article contributes to the narrative that highlights conflicts and erasure. With the publication of the Arabic version of this article in December 2016, it became a part of the conversation it tells about. And yet the issue at hand is not an opposition of a romantic fantasy of what Alexandria might once have been vs. a realistic recognition of what the city really is. The very question about what or where the city “really” is, is an exercise in fantasy. Every location of the city is the product of a certain politically and morally loaded work of imagination (Chiti 2016). Hamdy’s rewriting of the cosmopolitan myth from the point of view of the popular districts, Mukhtar’s emphasis on the ugly face of the city, even Ali’s search to deconstruct the narrative unilinearity of “the city”, are all expressions and draft blueprints of specific urban mythologies where sites, streets and fictional characters embody specific affective, political and moral visions and conflicts. They are blueprints with continuities, and yet as the change of tone in El Cabina events between 2011 and 2016 shows, they are also in a constant process of rewriting. that suits all its beauty. A longing for the future echoes Ernst Bloch's (1959) “concrete utopias”: visions of a better world that include a plan of action, or at least an expectation that they can be reached. For Bloch, Marxism provided the one true concrete utopia to strive for. But for those Alexandrian writers I know (especially those of self-declared revolutionary or leftist inclinations), crafting concrete utopias of the future is not literature’s main task. Especially the younger generations among them have less faith than previous generations did in the modernist ideal of “committed literature” (Jacquemond 2008; Pepe 2015). In a way resembling a wider tendency of liberal-left movements and thinking worldwide, they provide critique and alternative ways of life in the present rather than utopian visions for future societal progress. Insofar the literary visions of Alexandria discussed in this article deal with concrete utopias, they are either located in a nostalgic past; or there are inspired by the experienced, transient utopian moment of the revolutionary uprising that in itself was a better world even if it failed to change the future of the country. Future visions that I have encountered in recent literary takes on Alexandria tend to be rather dystopian (Shehata 2017; ElToukhi 2014), reflecting a wider literary trend in Egypt towards dystopian fiction (Towfik 2011; ElToukhi 2014; Nagui 2015; Rabie 2016; Alter 2016). Utopias of bright future are today more a thing of the right: be they militarist nationalist fantasies of grandeur, or Islamist promises of a moral society on the path to Paradise after death (although both also share each their own nostalgic past). Some of the concrete utopias proliferated by the regime in the shape of nationalist prestige projects and new cities, are all too similar to some dystopian fictions of a country divided between secluded rich suburbs and an urban hell (Towfik 2011). They only promise a better future for the better-off. Future is in any case a tricky thing in Alexandria. If carbon emissions continue anywhere near the current rate and the climate change goes on as predicted, large parts of the city will be submerged due to rising sea levels by the end of the 21st century (Stanley and Clemente 2017). The parts of the city that are closest to the sea are higher and will less affected, but most of the inland sub-urban crescent is built on former lakes and marshes, and will become uninhabitable. Alexandria will again be a city by the sea, but it will hardly be a beautiful sight. The news about the next, perhaps most catastrophic erasure in the long history of Alexandria's erasures are only beginning to reach the city's inhabitants. In the meantime, what concrete utopias, what imaginations for a thisworldly future,3 may be available for those inhabitants of the city who are not included in the regimes schemes of a new parallel Egypt for the rich? Perhaps writers are not the right addressee for this question. 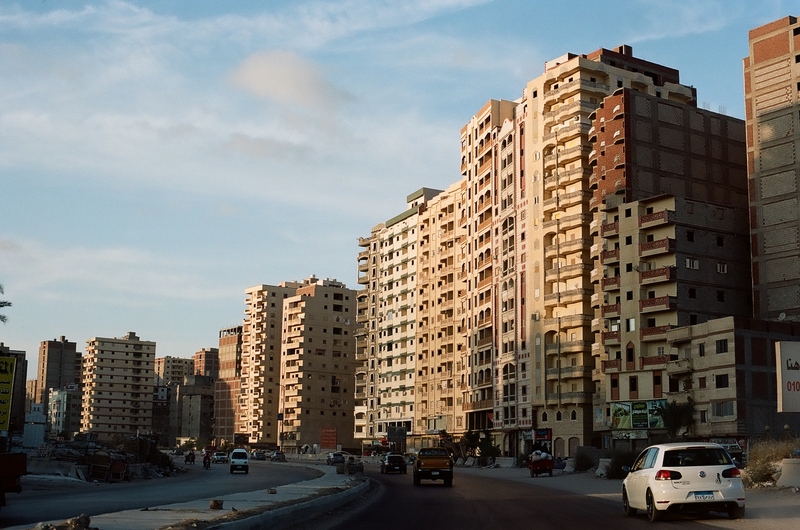 Omaima Abdelshafy's imaginary parallel Alexandria was remarkably void of details: a critical companion of the materially existing Alexandria rather than a vision of what it could also be. 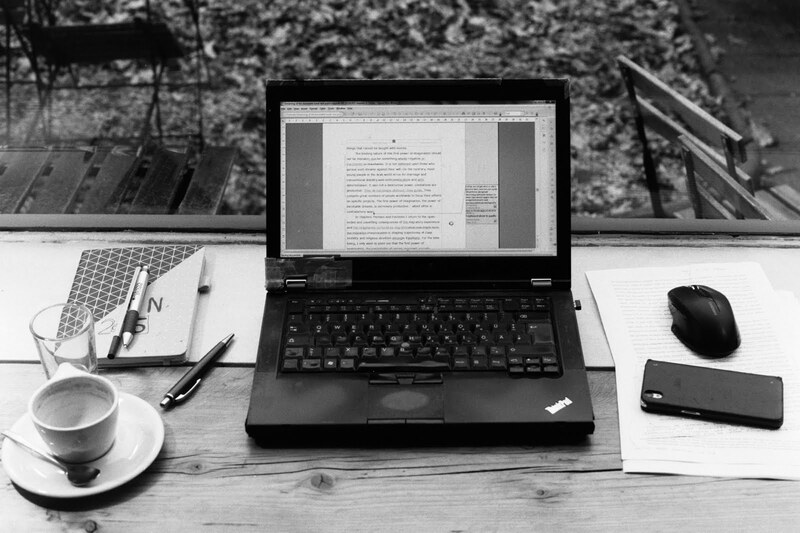 The more important power of literary imagination is not to produce daydreams, but to give reality a twist. And while one should view utopias critically, one needs to be cautious about urban dystopias as well (Robinson 2010). There are also other useful visions around. In spring 2016, I visited Mustafa again in the Chinese Housing. He had made some progress. Since business in his original trade was bad and no improvement was in sight, he had opened a shop for household goods as the junior partner of a local trader. Business was acceptable, and he was feeling more at home than ever in the Chinese Housing, and yet he was disillusioned. He had put faith in the revolution in 2011, and voted for Islamist politicians in the elections that followed. In 2013, he had put faith in the military which he by then considered the best and only institution that could lead the country. In 2016, he was positive that there had been no change, and doubted whether any change could be expected in the near future. Mustafa, along with millions of others, is part and parcel of today's actually existing Alexandria. He is a rural-urban migrant who built a house in an informal settlement. He sympathises with the Salafi movement and their vision of purity, but does not live that way. He says that in practice, the best he can do is approximately following the right path without losing it completely from sight. He is a conservative man who at the same time is open and attentive for different people and ideas. He has a strong entrepreneurial spirit, constantly in search for new opportunities. He lives in what constitutes the anti-city for those who hold to the dream of Alexandria the Open City. And yet many of the values and attitudes he embodies are not so different from those held by the inhabitants of the Open City myth. He is subject to the powers that are transforming the city, but he is also adding his own effort in crafting it towards his needs and values. He reminds us that there still is more to tell about Alexandria. Rather than dreaming of the Alexandria that might be, Mustafa has been trying to imagine, in more pragmatic vein, what he may realise for himself and his family. He, too, finds it difficult to imagine how things might change for the better. Since a couple of years, his greatest longing is to migrate to the United States with his family to offer his daughter a better future. But while he has been submitting an application for the green card lottery every year, he also appreciates the opportunities that he has been able the find around him. The next time I met Mustafa in autumn 2016, I showed him the Arabic translation of an earlier version of this chapter to check whether I had quoted him correctly and whether he agreed with the passages. He agreed, and added: “For me, the Chinese Housing was like America.” He explained: when he moved to the area, he did not like it much, and his wife (who grew up in the East of the City) liked it even less. But he found it full of opportunities, and he learned to like it. Manshiya with its established businesses and networks was already occupied. It had no space for someone like him with no history and no connections. The Chinese Housing and the surrounding informal neighbourhoods, in contrast, were still in becoming, not yet solid, not yet occupied, and therefore a place where one could find and seize opportunities. For Mustafa, it carried some of the mythological aura of the American Dream. What makes Mustafa an interesting theorist of the city is that he does not try to provide a theory of “the city”. Instead, he has a handful of useful theories of different parts of the city, which he appreciates in different ways. His vision of Alexandria is not binary but rather plural, perhaps even pluralist. When asked, he was positive about Bahari being the real, authentic Alexandria. But he appreciates, even loves the Chinese Housing, Manshiya, and Bahari each for its own reasons: the first as a space of opportunities, the others as places for business but also for precious weekend outings, time out of the ordinary with his family or friends – each with different characteristics and qualities due to their different shape and history. Concrete utopias of the true, real city tend to pose and answer the question about where Alexandria is in a binary way. Mustafa's specific visions of different parts of Alexandria, in contrast, are not utopias but heterotopias, materially existing places that are qualitatively different from others – for better or worse (Foucault 1986; de Boeck 2004: 254-258). Heterotopias, too, carry the binary structure of mythology: they are “other spaces” as opposed to an assumed normal, primary space. But it is a binary where the roles of “real” and “anti” are not firmly fixed. The Downtown area and the seafront are heterotopias par excellence: areas associated with outings, shopping, a time out of the ordinary - and also counter-normative activities such as drinking in bars (see also Ryzova 2015). As a metaphorical America, also the Chinese Housing has heterotopic qualities – this time juxtaposed to Downtown as an established Old World. In similar way, Mukhtar's and Ali's writings and reflections about the East of the City evoke urban heterotopias that mirror (and are mirrored by) older forms of urbanity that are being erased. And while Hamdy's Ghurbal of his childhood and the House of Cavafy (the one where the museum is, not the one from which Hamdy and Khaled were kicked out) can be elevated into embodiments of a concrete utopia of true Alexandria, they could also be told about as heterotopic sites among others that mark the city's many imaginary locations. Considering myths as social theories means considering the possibility that some of them may give a truer, more helpful account than others of the realities they describe. The essentialising utopias of an organic, true, better city that are evoked by cosmopolitan nostalgia in its popular-quarter and seaside varieties alike need to be recognised as what they are: dreams and strivings for beauty and ease of life that are made only more compelling by their increasingly counterfactual character. However, anti-utopian myths of erasure and conflicts, along with a specific appreciation of the heterotopic qualities of a fragmented city, can provide a better orientation to understand what kind of a city Alexandria today is, where it is and in what directions is it moving. هنا روابط لحواريت طويلين معي عن علم الأنثروبولوجيا وعن عملي العلمي على يوتيوب، الأول قام به أحمد يعد زايد في صالونه الفلسفي في الإسكمدرية في فبراير 2017 والكلام عن أنثروبولوجيا أو علم الإنسان بصفة عامة، والآخر قام به بلال فضل في برنامج عصير الكتب على قناة التلفزيون العربي في ديسمبر 2017، والكلام عن كتاباتي العلمية. Here are the links to two long interviews/conversations in Arabic with me about anthropology and my research, both on Youtube. The first is by Ahmed Saad Zayed in his philosophical salon in Alexandria in February 2017, discussing the scientific discipline of social and cultural anthropology in more general terms. The second is by Belal Fadl on his show Aseer El-Kutub (book juice) on Al-Araby TV channel in December 2017, focussed on my scientific research.